It has begun – the much-anticipated log cabin rug. 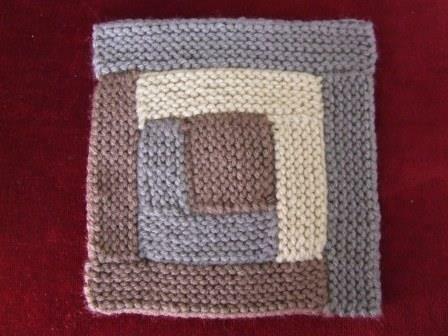 It is another pattern from the book The Knitted Rug by Donna Druchanas. I did a lot of fiddling around learning to pick up stitches in the way the book suggests and getting confused about the direction the strips were going around. I was starting to feel like a moron. Then I realised that the pictures I was looking at were going in the opposite direction to the main rug picture on the previous page. Oops. I am a visual person. Why would they put photos in there of the pattern worked the other way around? Some of us take pictures seriously! The moral of the story is: I like pictures. And the other moral of the story is: make sure your visuals are telling the same story as your writing.